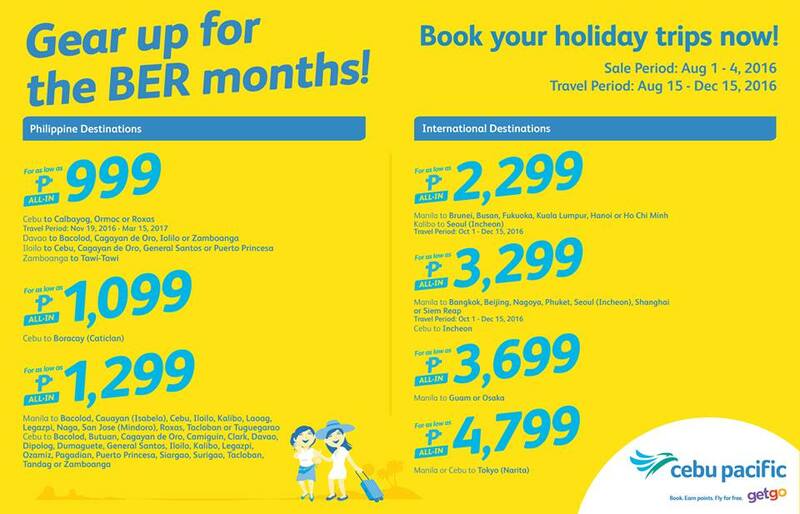 Cebu Pacific Promo Fare 2017: Start booking for your holiday trips for year 2017 now until August 4, 2016! Take note that some of the flights are valid for travel until December 15, 2016. So make time to double check your desired dates of travel. You can definitely take advantage of this promo of P999 all-in fare if you hail from Davao, Iloilo or Zamboanga. There are specific routes you can fly in. If you haven't been to Boracay and if you are from Cebu, this is your time to book a flight going to that wonderful white sand beaches of the island in the Panay region. I want Gensan to Cebu or Davao to Cebu. Sept. 10 and back Nov. 15. Gooday Maam/Sir, How to avail the Promo? I noticed that Cebu pacific never response to this blog post ever since I follow their promo notification. Hi! I am from Cagayan De Oro but I am bound for Puerto Princesa. Can I still avail the promo (999php)? I am just quite confused if the routes are fixed or pwedeng mag avail sa promo as long as pasok yung destinations mo sa promo? Thanks for clarification in advance! Wanting to know if there is a promo departing Guam going to Manila? do you have any promo for clark to kalibo by nov-dec 2017?